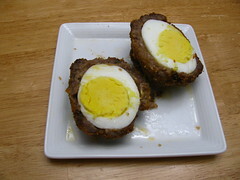 Have you ever had a Scotch Egg? I have only had one at a Renaissance Fair, but it was very good! 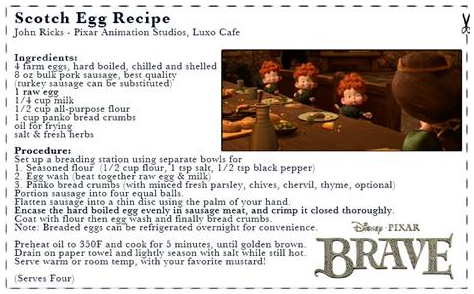 Try making this Scottish favorite with a recipe courtesy of Disney/Pixar and the upcoming film BRAVE, in theaters June 22nd. Click here to download nifty Brave recipe cards for both the Scotch Egg Recipe as well as Great Granny May Scott’s Cullen Skink Recipe – great for those of you who like fish. I have never even heard of a scotch egg before. Very interesting. Love how it looks. Maybe a breakfast idea for this weekend.